LAS VEGAS – Kobe Bryant has a warning for the rest of the NBA now that Steve Nash is joining him in the Los Angeles Lakers' backcourt. "We're going to have to be dealt with," Bryant said. 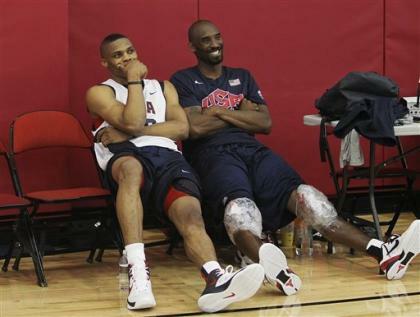 Bryant spoke after Team USA held its first practice of its Olympic training camp. He and the rest of the players didn't spend much time answering questions about who will make the final 12-man roster for London. Instead, the talk was dominated by Nash's move to Los Angeles and the rest of the NBA's free-agent frenzy. In the first week of free agency, Deron Williams committed to stay with the Brooklyn Nets instead of choosing his hometown Dallas Mavericks, Jason Kidd (New York Knicks) and Jason Terry (Boston Celtics) opted to leave Dallas and Ray Allen decided to leave the Celtics to join LeBron James and the champion Heat. The biggest surprise has been Nash's decision to join the Lakers. 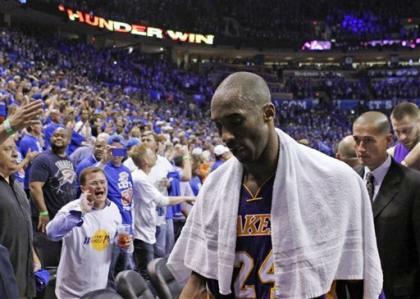 After the Oklahoma City Thunder eliminated L.A. in the second round of the playoffs, Bryant predicted that general manager Mitch Kupchak would make the team a title contender again by the start of next season. Turns out, he was right. Bryant said he immediately wanted to play with Nash once he learned the Lakers could get him. "It's not really weird," Bryant said. "We've obviously had our moments, had our battles. But at the core of it are two guys that came into the league at the same year . Myself, him, Ray Allen, [Kevin] Garnett, we're pretty much the last ones left. There is kind of a bond that comes along with that that's kind of bigger than some of the rivalries we've had." Bryant said Nash is the first stellar point guard he's played with since Nick Van Exel in the late 1990s. And he knows how much Nash can help the Lakers. "He gives us a much, much better [title] chance, obviously," Bryant said. "He is a terrific shooter. Shooting was something that was lacking for us. His ability to create for others in the pick-and-roll is one of the best we've ever seen. He has a high basketball IQ as far as being a coach on the floor. It gives us a great chance." Said Kevin Durant: "It's going to make them really good." Bryant also said he didn't think the Lakers were done making roster moves. The Lakers have had talks with the Orlando Magic about Dwight Howard, but a deal would likely have to involve their own All-Star center, Andrew Bynum. "I follow it as I'm sure everyone else does," Bryant said. "I don't know what is going on in his inner circle, what Orlando is looking for, what they want to do. I just hope the best for him and he lands in a situation where he is happy." Williams said he was leaning toward signing with the Mavericks until the Nets traded for Joe Johnson. Williams was considered the top free agent in this year’s class. "I wanted to get it over with so people would stop talking about it," Williams said. "I didn’t want to be the topic of discussion that way everyone else could worry about their free agency, too, since a lot of people had to wait for me to make a move before they could do something." The Nets also remain in talks for Howard. One league source said the Nets would likely need to get a deal done by the end of next week or else they would begin pursuing other free-agent options. …Eric Gordon reiterated his desire to go to the Phoenix Suns even though the New Orleans Hornets have said they plan to match the four-year, $58 million offer sheet the Suns gave him. Gordon said he's frustrated with the Hornets' inability to agree with him on a contract extension last season, the weak recruitment of him since free agency began and their decision to draft another young guard, Austin Rivers. Hornets general manager Dell Demps, who is in Las Vegas, declined comment.